My kids go back to school tomorrow – they are officially in 10th, 4th, and 2nd grade! I like to provide the lower grade teachers with classroom supplies as a welcome back to school gift. But of course I can’t just send those in to school in any old bag! 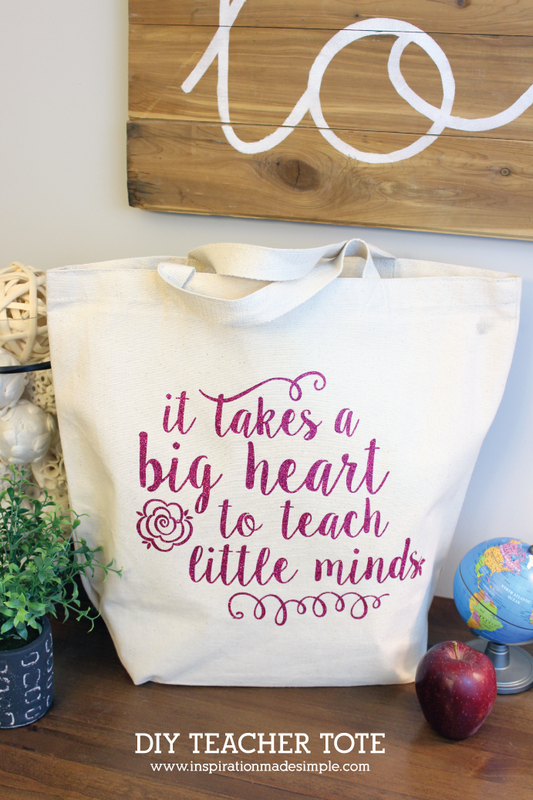 I had a couple of totes left over from my recent Lift Blog Retreat in Chicago, so I created a design based on a teacher related quote and used my Cricut Explore to cut the design out of heat transfer vinyl. SPARKLE heat transfer vinyl! (Post contains affiliate links for your convenience). Isn’t it cute? I filled it with all sorts of goodies – Lysol Wipes, tissues, markers, labels, post-it notes, personalized notepads, gluesticks, and more! Hopefully they’ll be able to put the totes to good use. Do you have a Cricut Explore? 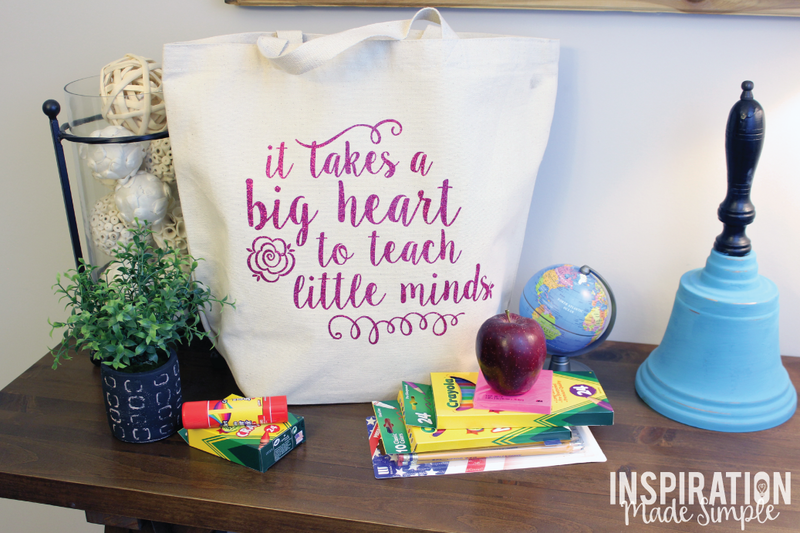 You can download the picture below to create your own Teacher Tote! You will need to upload it into Cricut Design Space as an image and set it as a cut file. From there you can manipulate it to fit whatever you want to add it to! If you’re doing a heat transfer like I did, make sure to click the mirror image button before you send it to your machine! I recommend heat transfer vinyl from Expressions Vinyl – I personally love their glitter vinyl. It’s nice and thick and easy to work with. Did you notice the extra little dot embellishments in the image above that didn’t make it onto my tote? My little sis just went off to college and we’ve been FaceTiming a bunch. It just so happens we were chatting away as I was weeding the vinyl and I totally missed those! Whoops! I was bummed at first, but honestly, I still love the design and I don’t think anyone but me can tell somethings missing. 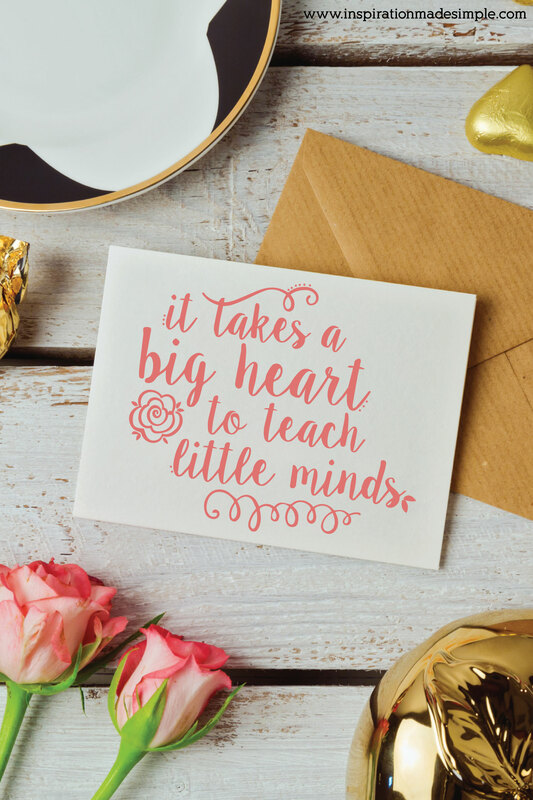 I’ve had lots of requests to make this design into a printable that can be given to teachers. I went ahead and did that in two different formats. The first is an 8×8 that can be printed onto 8.5×11 cardstock and trim to sized, the second is a greeting card. These are for personal use only. 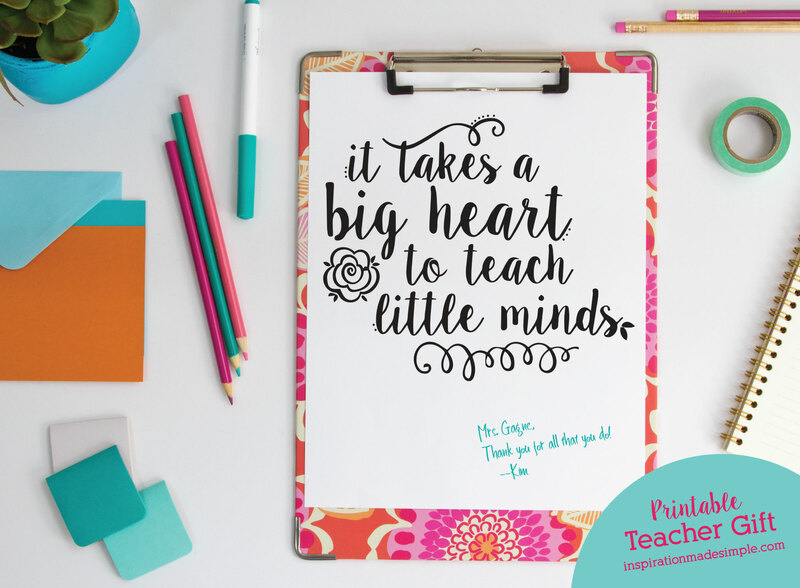 Download the pdf’s below, print onto cardstock and give to your favorite teacher! Love this! Where did you get the canvas tote? Is there a place I can buy them in bulk? Thank you! I got the totes from Consumer Crafts. They’re area reasonably priced and I would definitely recommend them! http://www.shareasale.com/r.cfm?B=679707&U=1035073&M=56778&urllink= (this is an affiliate link). I didn’t ask the original question, but THANK YOU! once you uploaded in cricut design, do you attach or weld the layers? You shouldn’t need to – it should all be just one image ready for cutting. Is it possible to get this image in higher resolution? I’m printing it on paper and its coming out fuzzy. This image is only intended for use to create a cut file with a Cricut Explore. But because I’ve received a lot of requests, I’ve created a pdf that can be used to print the image, plus I create some note cards that can be printed. The post has been updated with the files. Personal use only. Thanks! My daughter’s teacher would love this!!! Where can I get the tote? ???? Deiny, The tote is not for sale. I’ve shared the cut file that allows you to make it yourself if you have a Cricut Explore or Maker.